Great discussion last night about Helen Keller. Taking her words we tried to reconstruct how she was able to intellectualize all she did, why she enjoyed traveling if she had no sight or hearing, her joy at attending a circus… And so on and so on. She was a woman who found true joy and happiness in just being alive, and all that without benefit of two senses most of us take for granted. There was no sense she felt sorry for herself. On a couple occasions she felt down, but she didn't stay there. Instead, she reminded herself how blessed she was, how many friends and acquaintances she had – who loved her deeply – that Anne Sullivan was her beloved teacher. 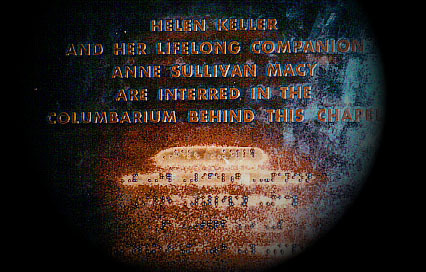 Keller and Sullivan are entombed in the Washington National Cathedral. Seems fitting two women so devoted to each other in life are together in death. To supplement the discussion of the book, I researched child development for the age at which Keller was struck blind. At around the age of 19 months – when she fell ill from either meningitis or scarlet fever – a child's vocabulary and understanding of basic concepts of the world outside herself booms. She fell ill at a very critical point in development, when she'd have been learning at an incredible rate, adding volumes to her understanding every day. How much she retained from her first year and a half no one will ever know, but we touched on how that may have affected the woman she became once she was able to communicate. Did she maintain, somewhere in her subconscious, concepts of colors and shapes? She reportedly loved gardens. Was a vague picture of what "flower" meant tucked away in a fold, somewhere in her brain? Things would have been very different for her had she been born in this century. But then, would she have become Helen Keller the world figure and role model? We had to leave that question hanging in the air, unanswerable. In my research I also learned there was an Academy Award-winning documentary of her life – Unconquered: Helen Keller in Her Story, made when she was in her 70s. I've ordered this via interlibrary loan, and hope with our current loaning problems it makes it to me. But if not, it's available via Amazon for a reasonable price. Fascinating material for discussion, all of this. I highly recommend the topic for other nonfiction book groups. Previous Post Today’s bestsellers, tomorrow’s recycling.